“How Much Biogas is needed to make Electricity, or Drive a Car from organic waste?” Is a question often asked. We will provide an answer which has been achieved for one high performance AD plant here, so READ ON! It is a remarkable fact that five times as much electricity is generated today, as 20 years ago. Furthermore, it is produced by the plant without significantly raising the feed input, thanks to improved technology. The yield is so well optimised that the operators say that the output could only be further increased if the citizens would separate their garbage more cleanly. Salad, fruit bowls, coffee filters, kitchen paper or plant remnants; they are all wonderful substances to bring light into the dark. There is a lot of energy in organic waste. 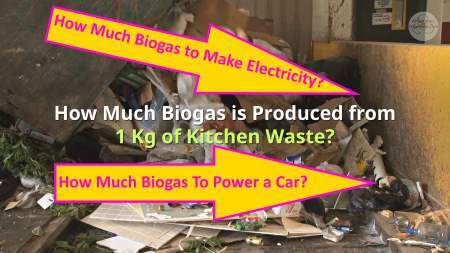 How Much Biogas is Produced from 1 Kg of Kitchen Waste? One kilo of waste is sufficient to produce 0.07 cubic meters of methane. One kilo of waste is sufficient to produce enough biogas to travel a kilometer, or two kilometers by an eco-car. This is what is achieved in Kirchstockach, Germany, where the County Council built a biowaste fermentation plant over 20 years ago. The biomass fermentation plant of the Landkreis in Kirchstockach, is operated by Ganser Entsorgung. This is the bio-waste recycling plant of the district of Kirchstockach, Germany. According to Landratsamt, last year, 4.1 million kilograms of CO2 would have been avoided. The support of the citizens for this plant is still very good. The authority produces 26,000 tonnes of organic waste which are produced each year from the county, which is 77 kilograms per inhabitant. The state capital of Munich also supplies another 6000 tons in Kirchstockach. The increase in the amount of electricity has nothing to do with the increase in the amount of waste. [Rather than that, it is a matter of how much biogas is created as a function of AD plant efficiency]. 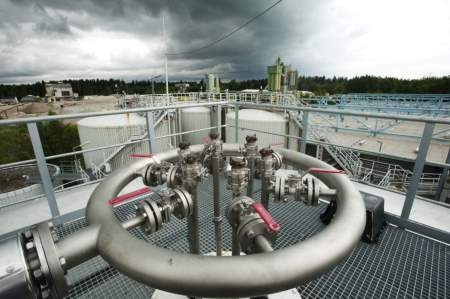 In recent years, there has been further investment in the biogas plant technology. Originally, the plant had only been planned for a throughput of 20,000 tonnes of bio-waste. An expansion to 30,500 tonnes by the construction of a new large hydrolysis reactor in 2010, led to a shorter dwell time of the mass in the reactors. It also led to an increase in how much biogas production is now achieved. An additional factor in how much biogas is produced was the renovation of the methane reactor, so that the biogas yield in the past year compared to the year 2009 was improved. It rose by 34 percent, from 60 cubic meters to 81 cubic meters per tonne of organic waste. The Gymnasium Ottobrunn is also supplied with heat via a CHP heating scheme, and hygienisation of the digestate (pasteurisation) is carried out; after all, it must be free of weeds and pathogens before it can be sold as a soil improver. The demand for own heat in the plant has been reduced. According to Managing Director Ulrich Niefnecker, this means that a higher amount of heat is available for transmission to third parties. Meanwhile, a contract on the supply of heat for the Gymnasium Ottobrunn had been concluded with the inclusion of heating to secondary schools in the southeast of the county. For four other schools contracts are pending. In order to be able to implement a full thermal heat (CHP) utilization at the location, in the short term, 2014 saw the start of a new project. This time not devoted to optimising how much biogas was produced, but to use the heat for the best value. A pilot experiment with the drying of wood chips and wood chips was undertaken successfully, and the project is now to be continued permanently. “27 percent of waste heat is used for wood drying, the goal is one hundred percent,” says Niefnecker. “Dry wood burns better and you can store it without mould developing,” explained the managing director. The operator of the plant is paid 75 euros per ten cubic meters of wood. According to Niefnecker, the improvements in the plant are currently largely exhausted. However, bio-waste recycling could still be further optimised if the municipalities could segregate the kitchen waste to an even better purity. “Sand and glass splinters are always there.” said Niefnecker. In the waste bins sent to the biogas plant there is still land a lot of dirt and material, which does not belong there. The amount of sand that has to be extracted in the plant prior to the processing of the organic waste has increased. It has increased so that it reached a maximum of 2300 tonnes, in 2016 . This means that 7.5 percent of the supplied so called “organic waste” was sand. Together with the branches, branches, plastics, stones and light metals which are also not desired, the amount of unfavourable substances is added to 6,192 Metric tons. “Sand and glass splinter are always there, but we also often find potato peelers, cola cans or batteries,” the managing director said. Thus, in order to improve the quality of the organic waste, it is necessary to achieve an even better separation of the substances before its introduction into the digester. For example, green grass, flowers and foliage are the correct organic waste, while branches and logs are not. Such material is used by the county, but only in other classifications of recycled material. Such unwanted material, should not be placed in garden waste and kitchen waste collections. This also applies to wood, earth, stones, general rubbish. That’s not all either, and it is a fact which many citizens do not know, probably because it is handled differently in Munich: for eggs and nutshells. The operators of the plant also strongly advise against the use of compostable plastic bags for organic waste. “They are not distinguishable from other plastics and usually are not made from corn starch”, Niefnecker explained. For that reason technique used by the biogas plant operators, is to pull out all the bags. “We recommend paper bags”, Niefnecker explained. Landratsamt now wants to publish a new detailed bio-waste separation list to the municipalities. It also wants to improve the education of the public, to promote a better separation. 1 m3 biogas kwh, biogas example, biogas m3 to kwh, biogas to electricity calculator, biogas to electricity conversion, biogas yield from food waste, High Biogas Performance, how long does it take to produce biogas, How Much Biogas Does it take make electricity, how much biogas is produced from food waste, How Much Biogas? We suggest that you read our articles on AD plant costs. To find our articles on the cost of anaerobic digestion plants search for “cost” using our search facility (top right), and read the articles which come up. 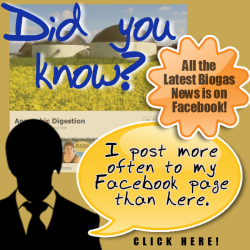 I often visit your website and have noticed that you always have good biogas information. But, here you say do not use biodegradable plastic bags. I disagree with you. The world must stop using plastic bags which are hurting more and more sea creatures. This is a crisis but you STILL say no to biodegradable plastic. You must change this if you have any care for animals.